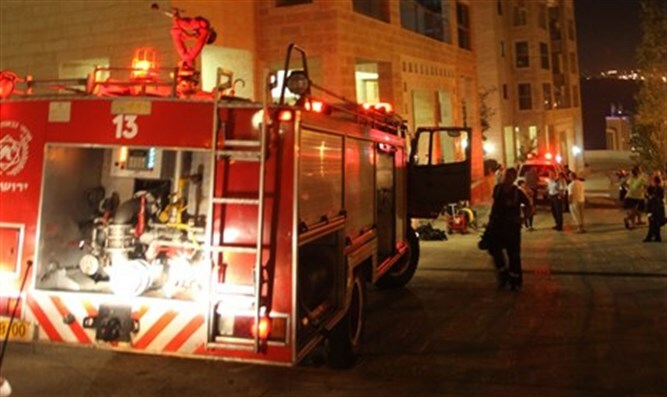 Senior citizen succumbs In apartment fire in Afula. 11 injured in Bnei Brak fire. A 70-year-old woman died when a fire broke out in her Afula apartment Monday afternoon. Yosef Zarchi, an emergency medical technician from United Hatzalah, said: "When I arrived along with the other United Hatzalah volunteers who live nearby, we encountered firefighting teams working to extinguish a fire in a residential building." "The firefighting teams pulled out a woman who was unfortunately deceased and who had suffered from burns and smoke inhalation. The ground floor of the apartment building was badly damaged." United Hatzalah also stated that its volunteers had treated eleven people who suffered minor injuries in another fire in Bnei Brak, including 5 children. The victims suffered from smoke inhalation. Zev Tepper a United Hatzalah ambulance driver who responded to the scene said: "United Hatzalah volunteers treated 11 people. One of them was a woman who jumped from the second story of the building as a result of the fire, while fire and rescue crews were working to evacuate all of the people inside. The woman suffered injuries to her lower extremities and limbs. She was transported to hospital by United Hatzalah ambulance."